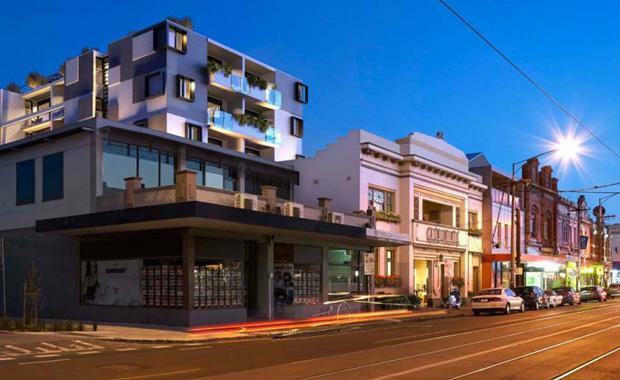 Brunswick is a fascinating inner Melbourne suburb which has seen much transformation over the decades in demographic terms as well as physical. To be located in the bustle of cosmopolitan and trendy Brunswick, The Union apartments will be a new standard in Brunswick apartment living. The Union will consist of 35 one and two bedroom apartments over six storeys, integrated with the building’s heritage façade. The site is located at 168 Sydney Road in the heart of Brunswick. Each of the apartments are offered in a choice of versatile and appealing configurations. The Union is being developed by TFT Investment with architecture by Daryl Pelchen Architect. Interiors by Adele Bates Design are clean and minimal with finishes and fittings used directly reflective of the artisan nature of the locale. Internal features include a range of Bosch appliances, Fisher and Paykel fully integrated dishwasher drawer, timber flooring in the living areas, stone bench tops, feature matte-black tapware, air conditioning, built in robes and LED lighting. Development features include a communal rooftop terrace with impressive 360 degree views and large balconies. List project pricing started from $290,000. With 70% of The Union now sold remaining apartments start from $360,000. The Union's sales agents VicProp reports purchasers have mainly been first home-buyers and local investors. Completion of The Union by builder Midson Construction is estimated for September 2017. Brunswick is located 6 kms north of Melbourne CBD. The area has had a strong migrant influence mainly from Europe and today features a lively mix of cultures with a happening café, restaurant and bar scene. The main thoroughfare is Sydney Street with an eclectic mix of bakeries, cafes and specialty shops. Brunswick is well served by trains and trams. The suburb’s population was 22,766 at the 2011 census a 9% growth from 2006. The predominant age group in Brunswick is 25-34 years. 50% of homes are owner-occupied.